Do you think your pillow is getting in between you and a decent night's sleep? Are you constantly suffering from back/neck pain even after a long 8 hours+ night's sleep? Spending some money in a quality memory foam pillow might be the ultimate solution to all your sleep related troubles — or check out our awesome sleep infographic. Although you might find a wide variety of options if you decide to buy a new one from your nearby mattress store, almost all of them will end up costing you more than you are willing to spend. 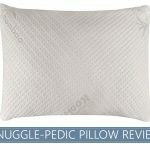 You need to find a pillow that's designed to relieve neck pain so you can have your quality sleep back. The other alternative is to shop online, and it is way cheaper than you might think. Online shopping is the ultimate solution to get more worth out of every dollar you spend on your purchases. It does so, by ever so elegantly, cutting out the middle man – the mattress store. The Coop Home Goods Adjustable Shredded Memory Foam Pillow will let you get the most out of your naptimes so that you always wake up full of energy and pain-free. It is one of the highest rated pillows available in the online world, and it boasts of a completely adjustable design that lets you customize it according to your own body. This amazing headrest promises complete support and a luxurious night's sleep with its inventive adjustable memory foam construction. If you think about it, you spend around 8 hours a day (almost 1/3rd of your life) sleeping, why not make it worth your time? 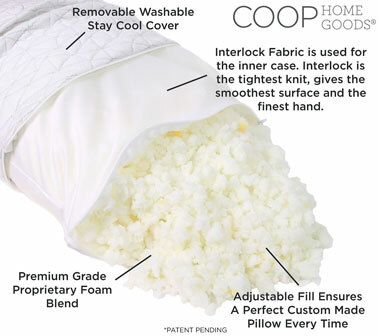 Since you are going to spend so much time resting in your bed, you need to know what makes the Coop Home Goods pillow stand out among the rest? Let's find out! This particular pillow is created with shredded visco elastic memory foam. This allows for greater airflow and adjusts way better than a normal memory foam does. The polyester-bamboo cover adds to the breathability and feels amazing against the skin. The most amazing feature of this product is the ability to adjust the filling to suit your exact preference. You can remove the outer cover to reveal the inner part which has a zipper to protect the foam. You can literally remove/add some of the foam to adjust the support your neck/head needs to snooze through the night. One of the standout features of this product is that it offers outstanding support with a unique combination of firmness and breathability that will adjust to whatever position you chose to sleep in. This makes it ideal for side, back and stomach sleepers. If you are a side sleeper, it is mandatory for your headrest to fill in the space between your head and outside part your shoulder for you to sleep comfortably. If you are a stomach sleeper, you need a thinner, softer headrest so that your body is not forced in an unnatural position. This also holds true for back sleepers as a thinner pillow allows for a better body alignment during sleep. One of the biggest reasons online shopping is the latest trend is because it makes it possible to find the highest quality products for a really competitive price if you know where to look. This pillow is available for less than half of what you might spend if you bought a similar option from your nearby bedding store. This is your chance to get a luxury pillow for the price of a knockout price. One of the biggest reasons we advocate shopping for a pillow online is the outstanding trial periods and return policies offered by the famous brands. It is actually possible for you to try out the product for a few days and decide if it is ‘the one'. Coop Good Home offers a 30-day trial period. The company is so confident you will love their pillows that they are offering a complete refund with pre-paid return shipping on all their products if you are not absolutely satisfied with a purchase. It also ships with a 5-year warranty. You literally cannot go wrong with this offer. Spending some money on a top-quality pillow might be one of the best decisions you make. 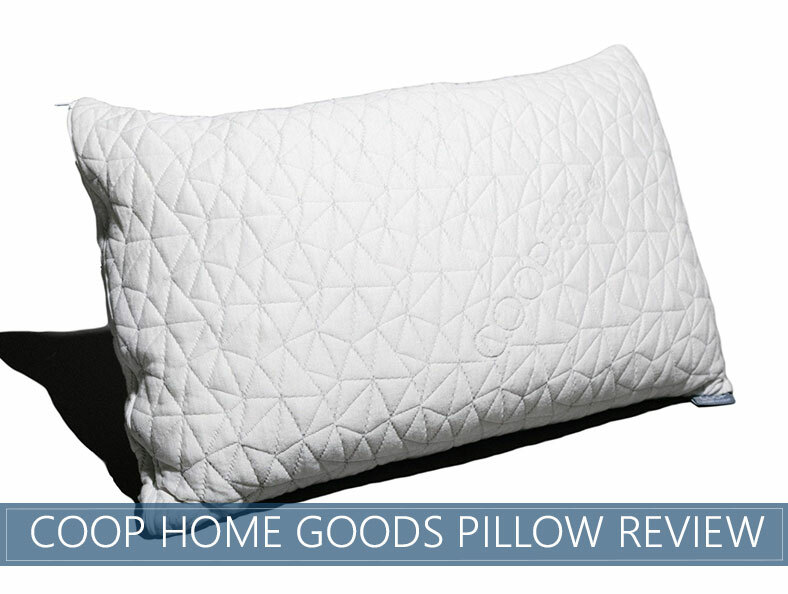 The Coop Home Goods Shredded Hypoallergenic Memory Foam Pillow is an adjustable model that can imitate your personal choice to help you make the most out of your naptime. Although a few customers had some trouble with the firmness and odor at the beginning, the customizable construction allowed them to shape their pillow according to their preferences and the weird odor was gone after a couple of days. When you compare it with similar products available online or in your nearby mattress store, this product will tick all the right boxes and still come out as one of the cheapest alternatives. Actually I have Kyphosis of upper spine! Also have breathing issues and must sleep with upper body somewhat elevated. A back sleeper needing relief from neck pain, any suggestions on pillow that may meet both needs?